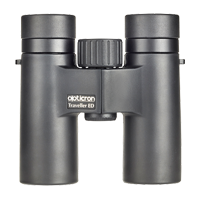 It's not often I jump in to a review just weeks after the arrival of a new binocular, but the Traveller BGA ED left such a good first impression on me, I knew I needed to put it to the test. The new Traveller BGA ED has been long anticipated in the optics market, having heard it was in the pipeline since early 2016. Opticron's production has been carried out with scrupulous attention to detail, so I have (albeit in a relatively short time) also been scrupulous in my testing. The two most notable improvements to the new Traveller BGA ED (compared to the Traveller BGA Mg) are the appreciably wider field of view and ED glass. The cost implication isn't dramatic, with the old model still available for around £70 less, but optically the new BGA ED 8x32 and 10x32 offer so much more. 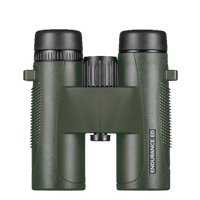 With an 8.2° and 6.5° FOV respectively, the 8x32 offers one of the widest images of any similarly sized binocular on the market and even the 10x32 offers a wider field of view than the old BGA Mg 8x32 (6.4°) does. This does make for a very pleasant viewing experience, especially considering the large 'sweet spot' these bins offer. The extra-low dispersion (ED) glass reduces colour fringing admirably, especially in the centre, with some chromatic aberration (barely) noticeable in the periphery of the image. Little to no colour fringing means no distracting 'glow' around birds in flight, a trio of Buzzards in difficult light conditions providing me with a truly testing scenario, where both the 8x32 and 10x32 performed beautifully. BAK-4 phase corrected prisms ensure a high level of clarity and definition, while fully-multi coated lens elements, coupled with Opticron's 'Oasis' prism coating (another name for dielectric coating), maximise light transmission. In fact, for a 32mm objective binocular, I was pleasantly surprised by their performance in low light. Although an equivalent 42mm did provide me with a greater exit pupil, the apparent brightness of the Traveller BGA ED exceeded my expectations. On a typically British overcast day, they certainly outshone the Hawke Endurance ED 8x32 as a male Blackbird sat on the roof of the farmhouse long enough for me to compare the two. 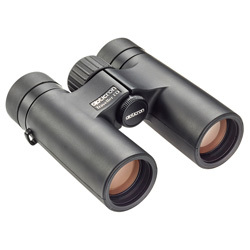 It's not quite a fair test as the Hawke is a less expensive binocular, but the difference was noteworthy. Overall, the level of brightness and colour was far superior with the Opticron, the bright yellow beak of the Blackbird stood out starkly against the black feathers through the Traveller BGA ED, whereas the Hawke didn't reproduce the colour with the same intensity. Close focus is quoted at 1.8m (6 feet) for both magnifications, in my tests I could get a fraction under 1.5m (5 feet), so it seems Opticron have been cautious in their specifications. 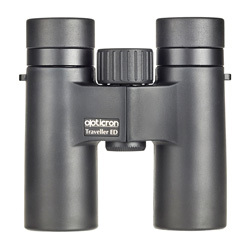 Unlike the BGA Mg, which have a magnesium body, these new Traveller binoculars are polycarbonate. There are many varying opinions on body materials out there, though the general consensus is that magnesium is superior to polycarbonate. In practice of course, assuming you were to take good care of your binoculars, there would be no difference. I am unsure of Opticron's reasoning for not using magnesium with the Traveller BGA ED, perhaps it was cost or weight, but a comprehensive 30 year guarantee is reassuring. The whole body is covered in a fairly smooth rubber armouring, as are the multi stage twist-type eyecups, which provide glasses wearers with 19mm and 17mm eye relief on the 8x32 and 10x32 respectively. Each stage clicks and holds firmly in place, no hint of them twisting back down when pushed against my eyes. The ribbed focus wheel takes just over 1 full turn from close focus to infinity, which is fairly fast, but is met with a smooth verging on slightly stiff tension, making fine adjustments easy. The dioptre is placed in the classic position under the right eyepiece. It isn't lockable and rotates in a smooth motion, with plenty of resistance against accidental adjustment. As expected, they are nitrogen gas filled and o-ring sealed, tested to a 3m depth by the manufacturer. Both models weigh a fraction over 450g and measure in just under 12cm tall (without lens caps or rainguard). These figures are fairly small for a 32mm; not quite so much as the Traveller BGA Mg, but appreciably smaller and lighter than the Hawke Endurance ED. Their size should suit most hands and would fit in a large pocket, although there would be little need to tuck them away when you barely notice you're wearing them with the neoprene strap. There are very slight thumb recesses under each barrel, which serve little purpose to be honest. As mentioned earlier, the Traveller BGA ED are backed by a 30 year warranty. In the box you will find a comfortable neoprene strap, a professional series microfibre cleaning cloth, a soft neoprene case (with its own strap and belt loop) plus of course a rain guard and stay-on lens caps. It's a very, very capable binocular. The 8x32 will certainly appeal to a wider audience with its unrivalled field of view and larger exit pupil, but the 10x32 shouldn't be discounted without consideration. Both are a complete package, quite a surprising one at that when you consider its diminutive size and weight. In all honesty the polycarbonate body doesn't bother me one bit, certainly if that's what it took to keep the weight and cost down to as low as they both are. 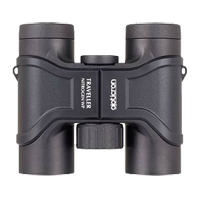 As the name would suggest, these binoculars would make a perfect travel companion and most certainly won't let you down.